Is SF becoming cool? 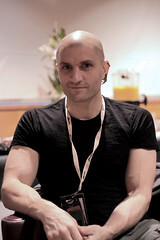 If it is, as China Miéville claims, then the award-winning author, whose new novel Embassytown hit the shelves yesterday, may have something to do with it. In our current era of austerity, with the largest-ever protest march on the nation’s capital and a previously apathetic youth culture rallying to the UK Uncut banner, Miéville’s homebrew of weird fiction and radical politics seems ever more relevant. Despite the current slew of mindless SF-flavoured Hollywood blockbusters, Miéville reminds us that beneath SF’s skin-deep popular appeal beats a radical heart.